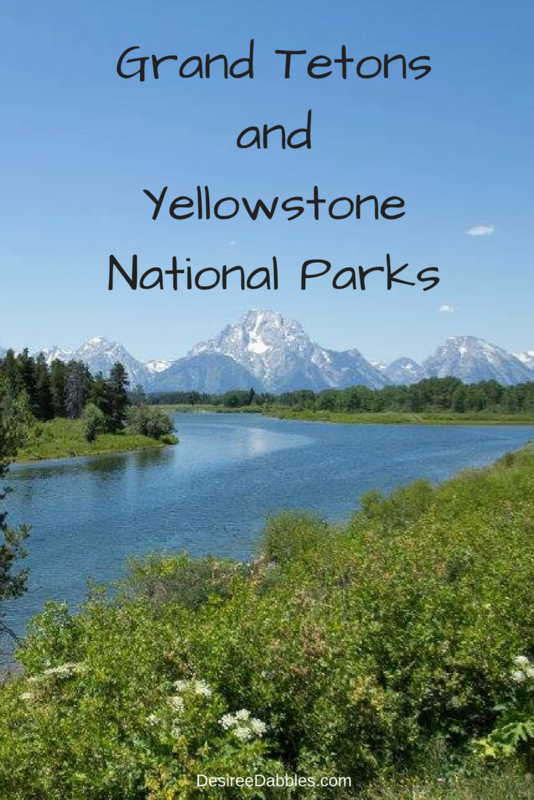 After leaving Utah, we continued north toward the Grand Teton National Park. We took the scenic route, driving along Bear Lake and up through Afton, Wyoming. We entered the park at Moose Junction. We did part of hike at Jenny Lake, making sure to use their bathrooms while we were there, then went to the Jackson Lake Lodge. We took the short hike up Lunch Tree Hill, and it was an awesome view. When we got back to the lodge, they were having an ice cream social (by donation), so we got some ice cream and rested in the air conditioning. We made sure to stop at several of the turnouts along the way to take in the views as well as stretch our legs. After leaving the Tetons, we headed straight into Yellowstone and camped at Bridge Bay Campground. For being the middle of summer, it wasn’t as crowded as I thought it would be. In the evening we went to the ranger presentation about wolves in the park, so that was cool too. The next day we started off by walking around the West Thumb geysers. Then we headed to Old Faithful. We got there with plenty of time to walk around to the back side of the geyser, which still gives great views, but with much less crowding. In fact, there were only 2 other people near us when she finally blew. Afterward we saw the lodge and went to the education center. Next stop was Grand Prismatic Spring, and the surrounding springs. We found a pretty good parking spot, which can be difficult, but we happened to be in the right place with someone else was leaving. It was very crowded, and people move kind of slow, but that’s ok, because it gives you time to take photos without holding everyone else up. We continued our auto-tour of the park by driving through Norris Canyon road to the Lower Yellowstone Falls. We stopped at the viewpoints along the rim drive, but there wasn’t much parking, so we never stayed too long. Then we drove north to Tower Junction, and across to Mammoth Hot Springs. We saw lots of wildlife along the way, even one bear, hanging out on a hill eating something. When we got to the hot springs, it was pouring rain, so my oldest child and I did a quick walk around, under our umbrella, and came back to the car. Wouldn’t you know it, not 2 minutes after we left it stopped raining and was pretty nice from then on. Oh well. After our quick tour of Yellowstone we headed up to Montana.